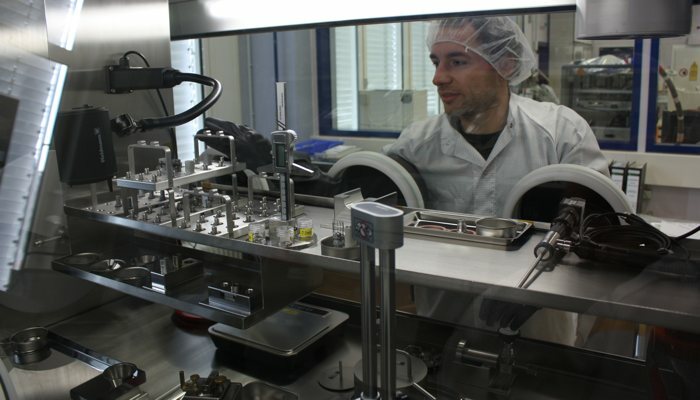 CeramTec is producing ceramic components for Astrium GmbH’s experimental unit, which will be integrated in the International Space Station (ISS) in July 2014. The sophisticated, complex silicon nitride components are required for specimen holders. This equipment will be used to analyze material science experiments under zero-gravity conditions in space. The parts will be used in the “Materials Science Lab – Electromagnetic Levitator” (MSL-EML) experimental unit, which will be integrated in the European science lab, called Columbus, on the ISS in July 2014. The unit can perform precision measurements that are not yet possible on earth in a temperature range from +400°C to +2,000°C for specific thermophysical properties of chemically aggressive molten metals. This enables scientists to analyze the early phases of development of a material’s microstructure. The objective of these types of studies is to deepen our understanding of transfer processes, atomic structures and material properties, which in turn will allow manufacturers to refine, improve and re-invent their production methods, materials and products. A variety of cylindrical and cage specimen holders made of silicon nitride are used here. The specimen holders enter a coil that contains metal alloy specimens that remain suspended by electromagnetic fields without any contact whatsoever with their surroundings. The specimens are melted, cooled in their liquid state and then re-solidified for the experiments. The electrical conductivity of materials used for the specimen holders must not interfere with the coil’s electromagnetic fields. Moreover, the specimen holders must exhibit extreme resistance to heat. The advanced silicon nitride ceramics used here offer all of the material properties required to meet these specifications. All of the ceramic parts on the specimen holders are manufactured by Baden-Württemburg-based CeramTec. The MSL-EML is an experimental unit developed by Astrium by order of ESA (European Space Agency) and the German Aerospace Center (DLR). It is used by groups of scientists from Europe, North America and Japan. It is the only unit of its kind in the world and has already been used in three Spacelab missions in cooperation with NASA. Astrium GmbH is a company of Airbus Space and Defense Group, the leading aerospace company in Europe.